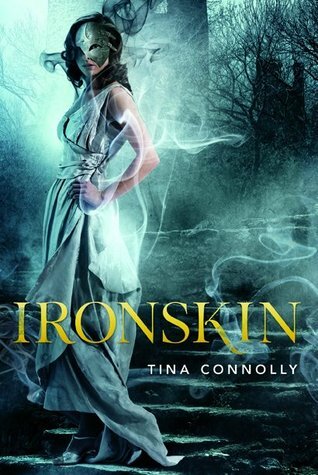 I know this is a little early, but I really want Ironskin by Tina Connolly. I mean, super bad. And I don't want to wait until Christmas - I need it ASAP. I have 8 dozen freshly baked, chocolate chip cookies with your name on it - if you can make this happen. Oh, you want to play hardball? Well, let's just say that there are some pictures of you in a... Delicate situation. Yeah. That is an awful buxom blonde woman who just happens to be "kissing Santa Claus underneath the mistletoe". I would hate for them to end up in the hands of a certain Mrs. Claus who is a bit perturbed with her husband's shenanigans. You know I'll do it. I've been on the "Naughty" list for years. Cool cover! I love fae book and this one sounds unique since she has to wear a mask to contain the fey curse. I really want this one too! It is sooo beautiful! I love the synopsis and the Jane sounds awesome. Great pick (: I'm waiting on this one too! WOW at the cover! I love the swirls. <3 I think I'm going to get this as well. Thanks for sharing! Oh God, chocolate chip cookies. i want those so bad right now. Which office am I breaking into to get a copy of this? Wow nice pick! This is a seriously gorgeous cover! Can't wait for this one to come out!! We should stage an invasion of Tor! OH MY GOSH. How have I not come across this before? It sounds AMAZING! Thank you so much for sharing, this is going STRAIGHT on the list. I hadn't heard of this one either! I was shocked when it came across my recommendations on Goodreads. I hope it's good! This sounds like a Faerie version of Jane Eyre, which is interesting , to say the least. I may have to add this to my TBR list. Great pick! The cover kind of makes me laugh, but it sounds AWESOME. Awesome review!Having a scar is a terrible thing; but one thing about the book that I like is when Jane had overcome her insecurities and rediscover her life. Nice book cover, by the way.